A New Jersey native, Sandra Flood is a self-taught oil painter of emerging popularity and relevance. Working mostly with dark hues, shadowy figures and subjects with pained expressions, her many works might initially seem too macabre to fully understand. The subjects Flood paints all have untold stories of a shared theme: pain, and survival through it all. Flood shows not the cold-hearted, monochromatic and typically dismal end-result of someone who has survived a lifetime of pain, but rather the weathered yet still hopeful one of someone who still has stories to tell. There is one distinct difference in Flood’s painting that truly stands out in such a powerful way: emotion thrives behind the determined look of a survivor. The woman, who is mostly covered and thus almost seems to become one with earth-toned scenery, hides her pain not out of fear, but much like a veteran who has already seen the unforgettable. Her clothing and stern look suggest she is able to look danger in the eye (or, in this case, over her shoulder) but through her own struggles has gained the wisdom to protect herself. The subject reminds us that we all have experienced pain to some degree – but we cannot simply stop moving. It takes real strength to continue on and not afraid to embrace the future. Sandra Flood is asking us to be confident and rely on our newly found strength which is what will protect us moving forward. There is one distinct difference in Flood’s painting that truly stands out in such a powerful way: emotion thrives behind the determined look of a survivor. I wonder what this woman is looking at. Who or what is trying to harm her? 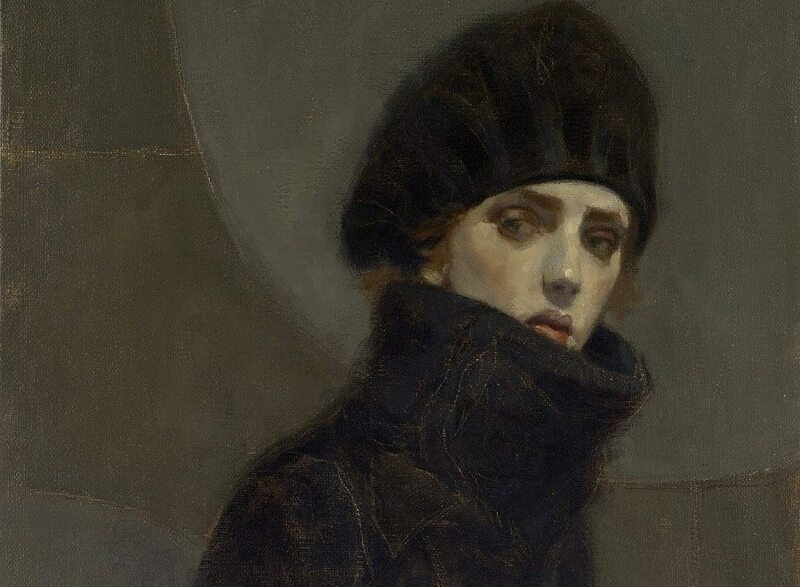 The dark and slightly muddled color palette adds that great sense of uncertainty to this painting. I like how you ask us to relate this painting to our emotional lives! Strong piece. The textures that Flood uses in this painting add to its meaning and story. It shows that people are not perfect and some people more than others are worn out by the pain and struggle of their experiences. I agree that not only is the woman in pain, but she has a sense of strength as she looks back with a jaded look in her eyes. Life is all about perspective and I too think that pain is inevitable but it is how we respond after that defines us as individuals.